At my bookstore we were talking about the laziness involved in comparison reviewing. Trust me: any writer hailed as "a modern-day Jane Austen" isn't. She couldn't be, even (or perhaps especially) if she were trying to be. It's the same with movies that are claimed to be "Hitchcockian"--it's a guarantee that they'll be laughably bad suspense thrillers that are neither suspenseful nor thrilling. But there is a recent movie that has a Hitchcockian feel, at least for its first half, and not because anyone gets murdered. The writer (Nick Hornby, basing his script on Lynn Barber's memoir of her adolescence in the early 1960s) and director (Lone Scherfig) of An Education (2009) understand the perverse dynamic of some of Hitchcock's most memorable work. In Rear Window (1954), for example, Jimmy Stewart's Jeff is a Peeping Tom who spends his days and nights spying on his neighbors. But we are quickly drawn into complicity with him; soon we're seeing his neighbor's actions through his eyes and can't wait for him to pick up his telephoto lens again. In Psycho (1960), Anthony Perkin's nerdish motel clerk Norman Bates is trying to dispose of a dead body. He places it in the trunk of the victim's car, and tries to sink the car in a swampy pond behind the motel. The car rolls into the water, tips upward, and sticks there, half exposed. In that moment we feel an sharp twinge of anxiety--for Norman!--and then a surge of relief when the car finally sinks beneath the surface. We want him to get away with it; not for the first or last time, Hitchcock has manipulated us into identifying with the wrong character. There's a similar moment in An Education, though it doesn't involve any bodies in car trunks. David (Peter Sarsgaard), a man in his mid-30s, has been taking the 16-year-old schoolgirl Jenny (Carey Mulligan) out to classical concerts, fine restaurants and swank jazz clubs. At first, we're suspicious--why isn't this man dating women his own age? But David is charming, reasonably handsome, flush with cash, and provides Jenny with an escape from her boring suburban life and predictable future programmed by her crassly calculating father (Alfred Molina). Despite some warning signs--not least that David is at least twice Jenny's age--we become as dazzled by Jenny's new experiences as she is. Midway through the film, David suggests to Jenny that they go off to Oxford for a weekend with another couple. Jenny is sure that her parents, and especially her father, will object to her spending a weekend in David's company. But David bets that he can convince him, and we find ourselves on David's side, hoping that the unsympathetic father will give in. The creepiness of the situation--that we're hoping for David, a predatory older man, to succeed in maneuvering a teenaged girl into bed--only sinks in once they're on their way. That scene in the hotel bedroom in Oxford is creepy, and along with Jenny we start to notice cracks developing in David's smooth facade. But as Jenny becomes increasingly disillusioned with David, her parents become ever more enamoured. 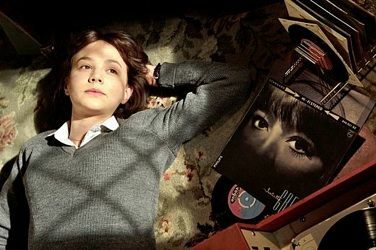 The best thing about An Education is the performance of Carey Mulligan as Jenny. She is utterly convincing as a 16-year-old yearning for adult sophistication, but unprepared for adult duplicity. The rest of the cast is excellent, too (and many faces--Olivia Williams, Dominic Cooper, Rosamund Pike, and brief appearances by Emma Thompson and Sally Hawkins--are familiar from Jane Austen adaptations). Hornby's script doesn't always allow the characters a believable complexity--the father and the headmistress of Jenny's school verge on caricature and are rescued only by the actors portraying them. The script also invents some scenes and changes details of Barber's memoir both small (names have been changed, of course, and that first weekend alone together was in Wales, not Oxford) and large. That's to be expected, of course, but one deviation from reality is particularly damaging. The school's headmistress (Thompson) is a coldly unsympathetic upholder of propriety. She refuses to allow Jenny to return to school because she's no longer a virgin, and she's virulently anti-Semitic, as well (David is Jewish). All of that is true to Barber's memoir. In the film Jenny then seeks out her sympathetic English teacher (Williams) for private tutoring for her exams. But according to Barber's memoir, it was the headmistress who sent the teacher to her. That change only serves to make the film's headmistress seem like an ogre, instead of the confused and conflicted human being she was in reality. The film also brought up some bittersweet memories of a time when I, like Jenny, rushed to embrace adulthood but was nearly overwhelmed by the emotional consequences. 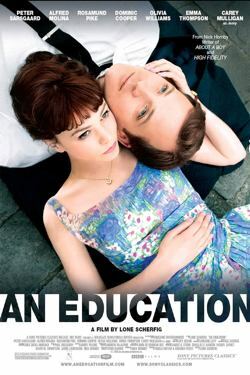 An Education is not a flawless work of art, but it is a well-wrought and thought-provoking film that is very much worth seeing--particularly if you recognize a part of yourself in the bright, impatient and impulsive Jenny.